DEAL: One to Five Day Discount Ski Tickets at up to 40% off! 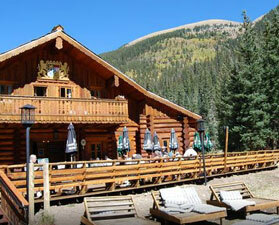 Check out our great Hotel picks and by owner vacation rentals for Taos! 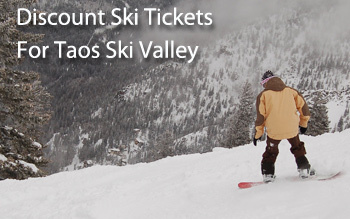 We offer discounts on ski tickets, ski rentals, lodging, by owner rentals, and apres ski ideas for Taos, New Mexico. Taos Ski Valley in New Mexico has light dry powder, and is renowned for some expert terrain you actually... have to hike to. With the combination of Hispanic and Pueblo Indian cultures, this is one of the more interesting places to go ski - can't avoid the cultural part too! Ski Ticket Sale!36-40% off up to 6 day ski tickets are already on sale! 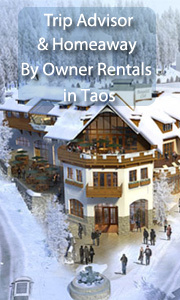 See All Our Great Listings for Hotels in Taos Ski Resort! Featured: Hotel Saint Bernard - Book it! "The location couldn't be better. Step into your skis right outside the door, drift about a 100 feet down hill to the lift and you are off. When the day is over, you ski right up to the same door and store your keys right inside. I can't imagine a more convenient ski-in ski-out arrangement. See All Our Hand-Picked Homeaway By Owner Vacation Rentals for Taos, New Mexico! 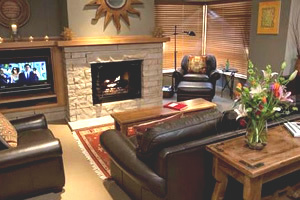 Featured: Taos Ski Valley Vacation Rental - 2 bedroom, 2 bath, sleeps 6, from $265/nt - Book it! Trip Advisor #FKN3482331 Taos Ski Valley has always been famous for its short lift lines, great snow, world-class ski schools, and challenging terrain. This 2/2 ski in/ski out condo sleeps 6 and offers guests luxury vacation accommodations, an ideal location near the Children’s Center and the Ernie Blake Ski School, underground parking, personal boot lockers with dryers, complementary ski valet service, a day spa and an on-site full-service ski shop. Great Apres Ski Ideas for Taos! 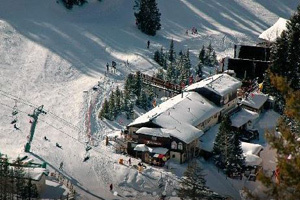 Book the best of Taos Ski Valley restaurants online with open table! Want to check another ski area! go to our main map! Taos Ski Valley blends Swiss/French/Austrian founders' roots with the traditions and customs of the local Hispanic and Pueblo Indian cultures and comes up with something unique and almost magical. Home of extreme skiing in the U.S., Taos' terrain was first tamed by founder Ernie Blake. But, it is not just a resort for experts, having loads of beginner and intermediate runs, and one of the nation's best ski schools. It also has an excellent children's day care and ski facility, some superb lodges, and beautiful scenery. 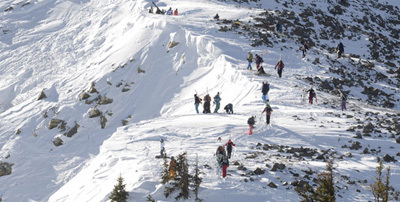 Until 2008, Taos was one of only four resorts in America that prohibited snowboarding. Known as the “un-resort-resort” because of its laid-back vibe, Taos is served by 13 lifts that provide access to 1,294 skiable acres. If you like it steep and deep, Taos Ski Valley will satisfy you. Due to its location in the Southern Rockies, Taos sees both epic snow and many bluebird days. © 2015 GreatCrestedButteLodging. All rights reserved.